Cake Smash Photography in Swansea. What better way is there to celebrate your baby’s 1st birthday than a photo shoot, smashing up a big colourful cake! Natural, fun photos of your baby - We even offer the same cake smashes for dogs! Swansea Cake Smash & Splash Photographer! 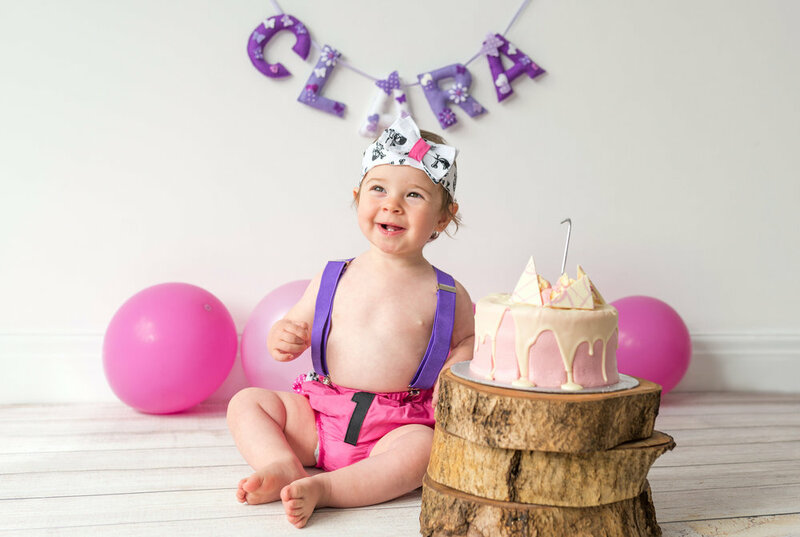 - Quite literally, your baby will be sat in front of a birthday cake and they’ll be photographed eating it, getting messy and having the best first birthday! 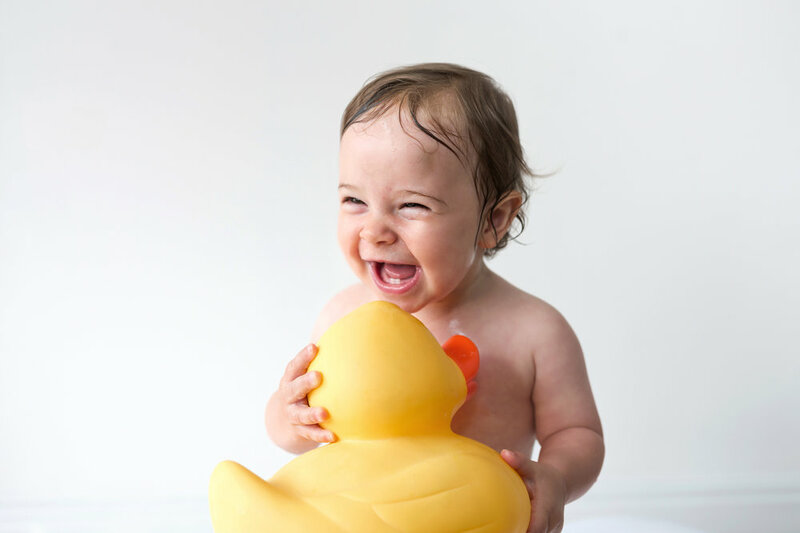 To clean them up after all the mess, your baby will be photographed having a splashing time, enjoying a lovely bubble bath in a mini bath tub with the giant duck too. Your cake smash session will take place at our home-studio in Cockett, Swansea. If you'd like your images back in time for baby's birthday, book for around 2 weeks before. The colourful yummy cake, a handmade fabric name banner to take home and matching balloons will all be included. We have a few cute outfits to choose from too. - A keepsake USB of hand retouched digital images will be sent to you in a beautiful little string tied box. This means you can print as many pictures as you like, as big as you like, for all the family too. Cheeky little cash smash photo shoot in Swansea! Blue theme for the very cute Jenson. Cake smash photographer session with a pink theme for sweet Elsie. Love the sound of a cake smash photo shoot? The total price for a cake smash & splash photo shoot, all-inclusive is £250 including a bubble bath too! You can book online today for a deposit of £50. These sessions can get very messy so make sure that you bring a spare set of clothes for you and your birthday baby - lots of wet wipes are handy too. If you’re adding the bubble bath option, bring their favourite fluffy towel too. We will supply everything else needed. To get the best out of your cake smash, a little messy play in the weeks leading up to your session will help baby get used to having sticky hands!! A dog 1st birthday cake smash session works exactly the same, except the professionally made cake contains only yummy dog friendly ingredients! The pricing is the same too, please feel free to book online using the button above or pop us a message with any questions.